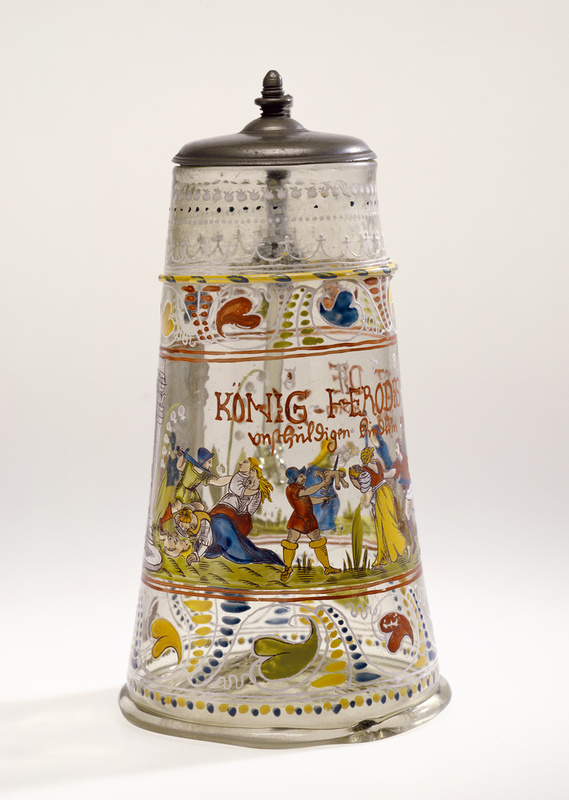 Inscription: Around the central zone of vessel, in enamel: " 1578 Konig. Herodis. Lest. Die / unschuldigen kindlein elendiglich todten" ("King Herod has the innocent children miserably killed"). Under the inscription King Herod has the innocent children miserably killed, King Herod sits enthroned in a curtained enclosure, witnessing four soldiers murdering small children while their mothers struggle. 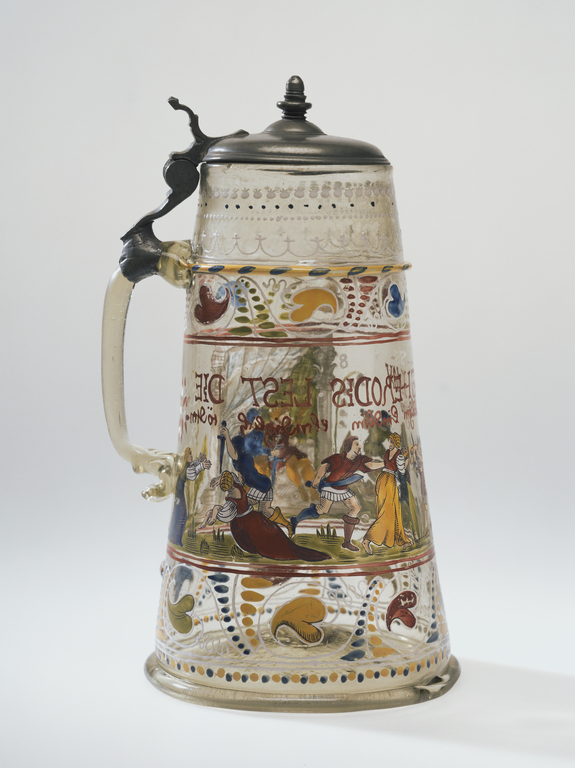 In addition to such biblical scenes, other common subjects for enameled drinking vessels included hunting, allegorical, genre, and heraldic themes. .Do but reflect a little on these Customs, and see how much it is impossible to leave off drinking. Saldern, Axel von. German Enameled Glass (Corning, 1965), p. 92, fig. 114. "Acquisitions/1984." The J. Paul Getty Museum Journal 13 (1985), p. 251, no. 220. 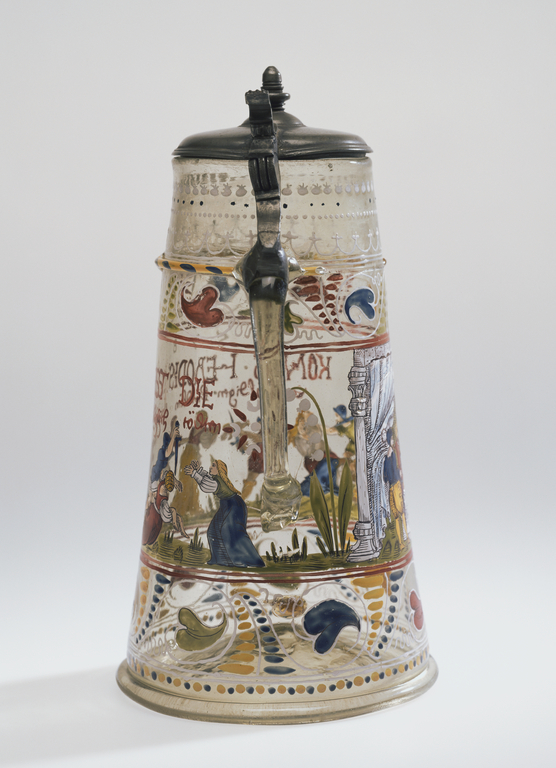 "Recent Important Acquisitions Made by Public and Private Collections in the United States and Abroad." Journal of Glass Studies 28 (1986), p. 105, no. 24. Bremer-David, Charissa, et al. Decorative Arts: An Illustrated Summary Catalogue of the Collections of the J. Paul Getty Museum (Malibu: J. Paul Getty Museum, 1993), pp. 254-55, no. 449. Hess, Catherine, and Timothy Husband. 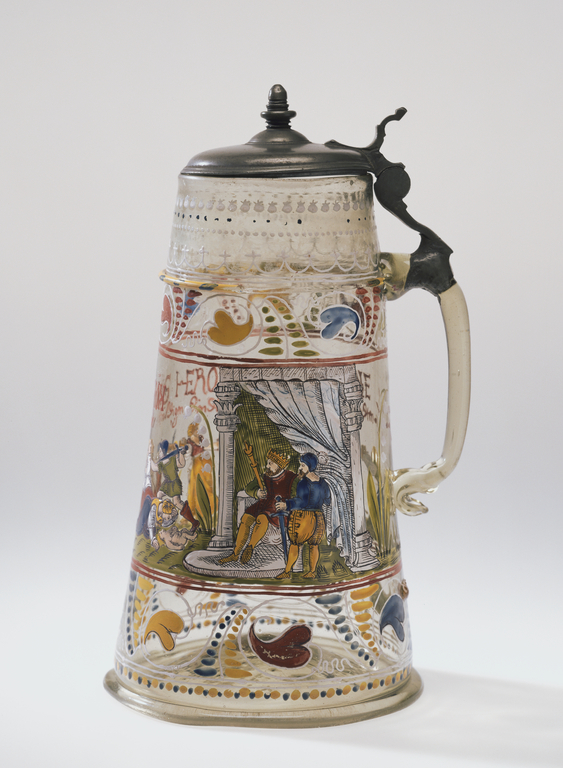 European Glass in the J. Paul Getty Museum (Los Angeles: J. Paul Getty Museum, 1997), pp. 199-201, no. 54. Wilson, Gillian, and Catherine Hess. Summary Catalogue of European Decorative Arts in the J. Paul Getty Museum (Los Angeles: J. Paul Getty Museum, 2001), p. 219, no. 442.